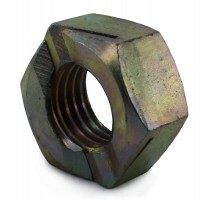 Binx nuts are a form of prevailing torque all metal locking nut. They have an axial slot in the top of the nut which deforms the thread inside the nut. This creates increased torque when the nut is tightened onto the fastener, as the thread in the nut is forced back into place, which provides increased resistance against vibration. Binx nuts are reusable, but it is worth noting that their effectiveness reduces each time they are reused. Bix nuts are not 'reversible', and can only be applied 'bottom first' with the axial slots at the top of the nut.